The term “Magic Realism” is most often used in a literary context to describe work in which an accumulation of plausible elements constructs an impossible whole. In this spirit, the Wood Turning Center has organized an exhibition of sculpture in which various materials mimic other materials to form a whole that is itself a further illusion. Illusion is implicit in visual cognition. In one sense, it is visual cognition. We perceive things through several senses: our way of knowing; but perception is itself a mediator, a veil between the self and whatever reality may exist outside. Ruth Borgenicht’s “Berm 1” could be described as three such veils, all a metaphor for vision. Real lace window curtains divide and screen our view of the outdoor scene among their interstices. Borgenicht’s curtains embed bits of an exterior reality into their ceramic loops. Our eyes (in popular cliché, the windows of the soul) are like Borgenicht’s window curtains. Disparate bits of visual information in the form of photons are processed in the retina by rods and cones and almost instantly synthesized into a perceived seamless, coherent and identifiable image. Scientists variously estimate that visual processing uses from 25 percent to over 50 percent of the brain. Whatever the case, it’s our most important sense; so, it’s no surprise that the urge to accurately represent things visually has been around a long time. At least 30,000 years ago Paleolithic people made representational images on three-dimensional stone surfaces. The animals (there are almost no humans or other contextual features) are depicted in action: walking, running, fighting — sometimes injured — even defecating. When I see photographs of these walls, which speak of their makers through silhouetted handprints and gestural swathes of color, I recall my brother as a child sitting with a notebook on his knees, pencil in hand, making pictures of fighter airplanes in flight. I see his frown of concentration and hear the staccato eh-eh-eh-eh-eh sounds he made as he drew dashes representing missiles. Then guttural whooshing explosive noises synchronized with the obliteration of an enemy plane by ferocious black lines. He was telling and living a story that was vivid — real — to him. There was no external audience just the truth of his self-created experience. We can’t know the motives of those painters, who seem to have appropriated the natural irregularities of stone to add dimension to the creatures they depicted. They were faithful to particular materials and a consistent language of image making for an unimaginable 25,000 years. Fashion or the idea of technical “improvement” apparently did not exist for them. We don’t know why they did what they did, but we do know that we homo sapiens still respond viscerally to that work. Our response is rooted in being human. Humans are hard-wired to identify what they see and to absorb languages of representation (including signals, signs, and symbols). The example of ancient Greek painting, once considered supreme but almost completely lost to the modern world, is instructive. Because we know it through contemporaneous descriptions and commentary we can reflect on the Greeks’ ideas about representation without being distracted by existing visual examples that we might interpret (see) not as the Greeks did but through our own visual language. We know that Antiquity prized trompe l’oeil. Legendary Zeuxis supposedly represented grapes so perfectly that birds flew down to peck them. Nevertheless, he was bested by his rival Parrhasios. His superior skill caused Zeuxis to ask him to pull back a painted drapery in order to reveal more of the painted scene “behind” it. Bird eyes, in reality, would never have been fooled by Zeuxis’ painted grapes. The delusional conviction we humans tend to have that our languages of representation are objective and accessible to everyone is evident in this story. Representation is indeed a learned or self-invented language that consciously or unconsciously involves some suspension of disbelief. The December 3, 2009, issue of The New York Times, reports that a member of the French Parliament, Valérie Boyer, has proposed a law requiring all digitally altered photographs in advertising to be labeled as retouched. Objections to the law center on the fact that it’s unnecessary. Everyone knows that commercial photography is all artifice, invariably Photoshopped. Nevertheless, our inner knowledge that the luscious “Penelope Cruz” on the cover of Vanity Fair magazine is color-adjusted, highlighted, polished, plumped up here and minimized there — all to conform to today’s notion of feminine beauty — does not keep us from believing that the “Penelope Cruz” product embodies truth. It is Penelope Cruz. Most cultures have a vision and version of artful realism. For example, the Japanese sculptors of Nikko made mostly wood polychrome human figures in which every element, including brocade clothing, is so convincing that photographs of them are readily mistaken for real people. The fact that some religions find representations of things so powerful that images are forbidden, underlines how impressive the magic of illusion can be. Only God, some believe, is permitted to make something “real.” The Nigerian religion Santeria allows — even advocates — making “real” art (representational and otherwise) for almost the same reason, believing that human creation emulates and honors the Creator of all. A major theoretician, art historian Ernst Gombrich, made a strong case that the artist’s paramount goal is to make something real. He also emphasized, however, that both artist and audience draw on a shared language or “schema” to complete an illusion. The success of a representation depends on the audience’s knowledge of and acquiescence to the schema. Such schema can be seen to extend to conceptual art which evolves from patterns of signs in the representation of ideas. Artists through history have used languages of communication — tools of representation such as foreshortening — to construct a reality, but not every artist has this goal. There is always an idea behind an artwork and some prefer to engage the intellect by taking systems of communication and patterns of ideation as their subject. They underline the provisional, artificial nature of communication, the magic grounded in societal agreement. These conceptual metaphors stand at one remove from trompe l’oeil: the Taoist butterfly dreaming about dreaming, an objectification of aspects of our shared languages of representation. Dan Saal, who devised the format through which you have accessed this sentence, addresses the ambiguous and provisional nature of communication by taking as his subject Braille, a familiar pattern of communication yet unintelligible to most of us. Saal’s incarnation of Braille is inaccessible to the blind because it is purely visual. Saal, a designer of books, catalogs and materials about art, here considers the nature of communication above knowledge that may or may not be contained in the pattern (this essay, for example). The pattern itself is the subject. Using different strategies to a somewhat similar end, Jim Butler entices our vision into a seemingly limitless space containing a hieroglyphic vocabulary of mundane yet iconic forms. Objects that should be touchable are not. Removed from their context they become recognizable signs but non-functional ones. What Freud called “the dream work,” is the prototype of art. In sleep, we create dreams and for a time they fill our reality with such completeness that doubt is unthinkable. The work in Magic Realism has convincing solidity. Each piece exists in space and deploys a multitude of small truthful details to build a reality that is simultaneously believable and unsettling — impossible and valid. In the post-modern period much art is about human artistry, human history and human behavior. Ambitious illusions in this show explore artifacts of daily life, things humans have made, objects that are mundane and yet filled with hidden meanings. Art about material culture can defy functionality while alluding to it. Lincoln Seitzman’s pieced and turned wood “basket illusions” were one starting point for Magic Realism. 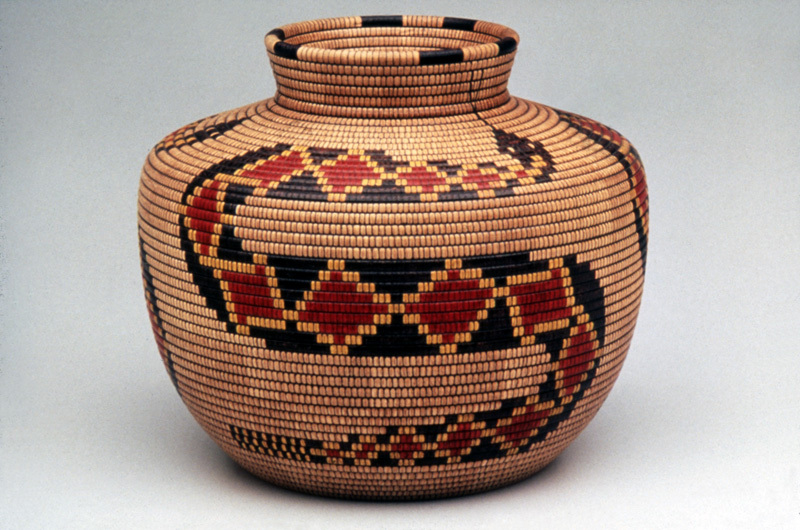 It takes a good close look to see that Seitzman’s illusions are just that — not original Native American basketry. Why invest so much time and training recreating another’s work so precisely — and in a medium that belies the purpose of the original? Seitzman’s answer is simple: He admired the old baskets so very much. His versions are portraits of a sort, an homage. So it is with many works in Magic Realism: they acknowledge the ingenuity, and profound achievements of other artists and the possibilities of materials. Much in the present show can be related to broadly interpreted vessel traditions. Ani Kasten’s pseudo-birch bark ceramic vase glorifies the representation of a rustic material with real gold. Conforming to Chinese tradition, Xuti makes certain that his ceramic bamboo teapots can really work as teapots in spite of the fact that future owners will almost certainly never think of putting tea in them. Greg Nangle’s narrative bronze and glass sculptures bridge the space between function and art by freezing a moment of functionality morphing into dysfunctionality. 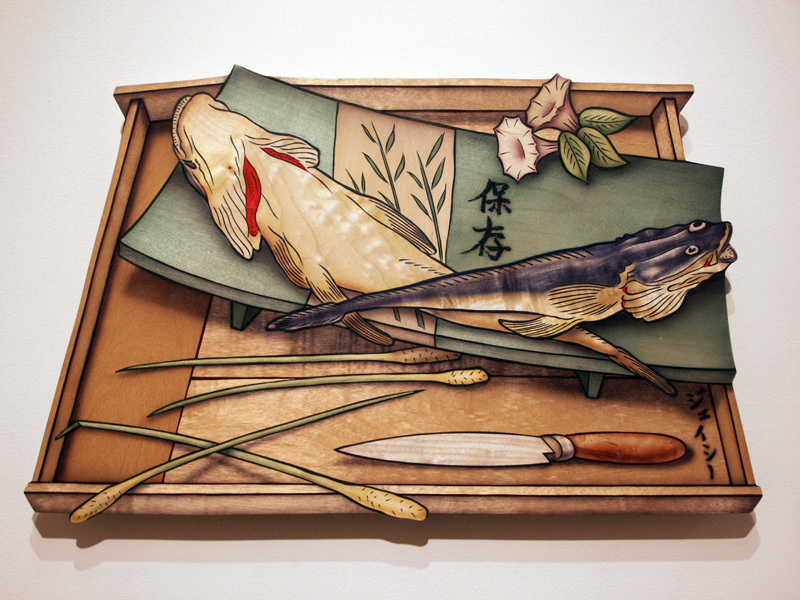 John Cedarquist’s trays contain depictions of food nested within depictions of smaller containers, but they are also effective containers in a more practical way. Clothing is a vessel enclosing the body, which is in turn often described as the vessel for the human spirit. Some pieces of clothing like armor are intended to maintain their structure no matter what happens to the malleable organic entity inside. Susan Glasgow’s glass bustier tells of the possibility that its metaphorical contents will shatter the restraining form if the inner attraction to cake is not stifled. The work presents conflicting survival instincts: the desire to be svelte and attractive to a potential mate and the desire to eat. Ron Isaacs’ soft-seeming shirtwaist and magnolia branch might hint at the transformation of a tree into a wood nymph in modern dress. Or is the transformation going the other way? Books contain ideas. They store narratives and concepts and serve them up at our will, as a teapot pours out the tea. From postcard to Post-it each item in Randall Rosenthal’s carved polychrome three-ring notebook contains bits of information about van Gogh, an artist whose expressive mode contrasts dramatically with Rosenthal’s. Every piece posted on Michelle Holzapfel’s William Harnett-like display board references the Philadelphia trompe l’oeil painter and, more directly, the important Dada collagist and installation artist Kurt Schwitters (1887 – 1948). Holzapfel arranges Schwitters’ important publications, with the same thoughtful attention he devoted to his “merz” art of ephemera and refuse. 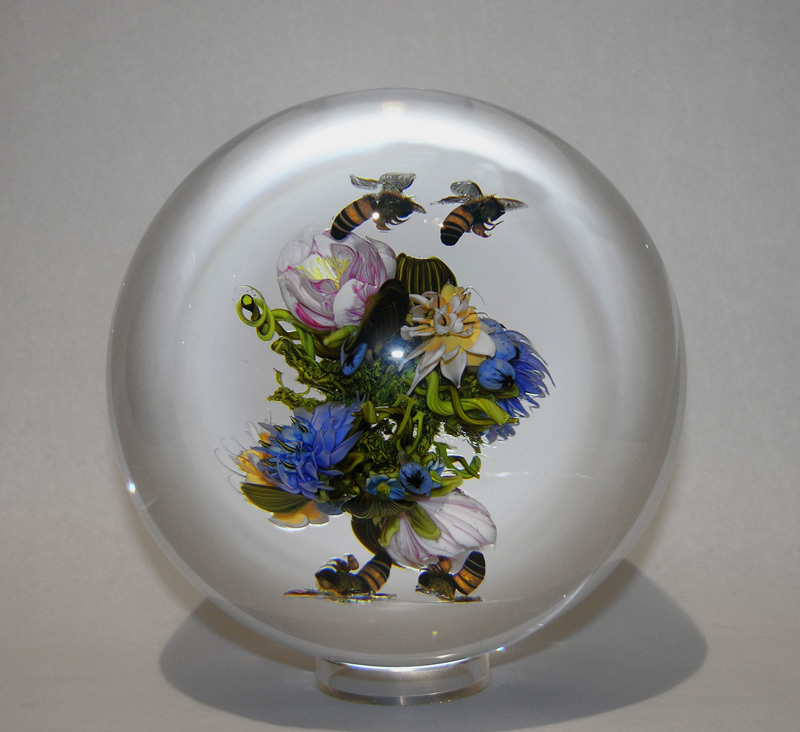 If illusionism (making “real” things) is the central art activity of art, nature must be the original subject. Where Janel Jacobson makes discreet natural forms in an accurate but idealized, essentially Platonic fashion, Paul Stankard captures selected quirky motes of color and form as he has observed them in life. From different but not incompatible perspectives, both address the ever-astonishing fecundity of the earth and cycles of life. A more troubling commentary arises in the work of David Wiseman who suggests that nature abides everywhere, even restlessly within the walls of our buildings. Brent Skidmore juxtaposes natural forms — boulders — with made ones manifesting the balancing act between civilization and nature. In “Twisted,” Tom Eckert suggests an obscurity of identities, mysterious barriers to recognition. The illusion of a draped ovoid suggests René Magritte’s “The Lovers.” In Magritte’s paintings, each lover’s head is covered by a white napkin, obscuring visual and tactile identity, even the certainty of humanity itself. The few representations we have of humans in prehistoric painting are stick figures. 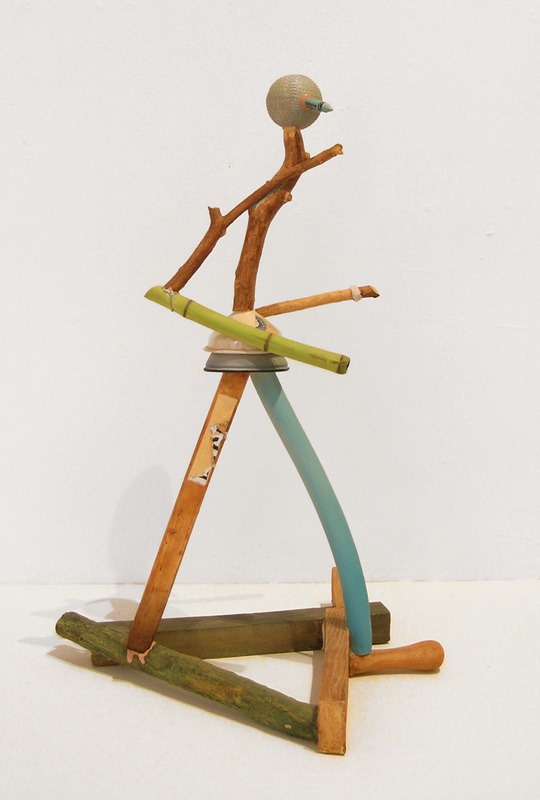 A similarly awkward, angular stick figure persists in the work of Richard Shaw whose pencils, golf balls and sticks have an exaggerated presence. Are they telling us that we, humans, are really made up of what we appropriate? The cipher-like figure certainly says that the human being is not the soul-infused vessel we might imagine but a construct, a compendium of disparate things. These sculptures bewitch vision and cognition. They tell us that our experience and understanding are powerful, mysterious and ultimately unfathomable as are our codes of communication, our history, behavior, and dreams. In spite of all our technologies, theories, measurements and artful skills, we know little more about the nature of reality than we did 25,000 years ago. Perhaps our early ancestors did not dream precisely as we do but millennia later we share those dreams. Thurman, Judith. “Letter from Southern France: First Impressions.” The New Yorker, June 23, 2008. “Illusionism.” Grove Art Online. Oxford University Press. 2010. Gombrich, Ernst. Art and Illusion. A Study in the Psychology of Pictorial Representation. London: Phaidon 1960. Erlanger, Steven. “Point, Shoot, Retouch and Label?” The New York Times, Dec. 3, 2009: E1. Alas, Mert and Marcus Piggott (photographers). Vanity Fair. Nov. 2009. For more on the utility of Braille, see Aviv. Rachel. “Listening to Braille.” The New York Times Magazine, Jan. 2, 2010: 42.